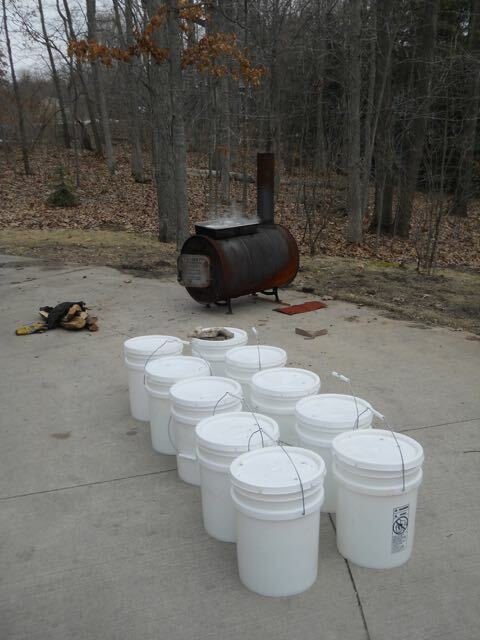 The 2015 maple syrup season is over! We finished boiling the last of the sap last night. 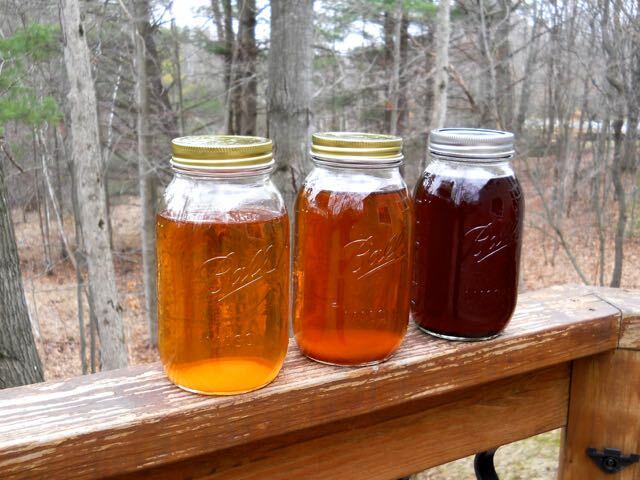 The color of the last syrup batch was considerably darker which is common as the weather warms up and the sugar content changes in the sap. I prefer the lighter syrup which has a hint of vanilla taste. We collected more sap than last year, but ended up with about the same amount of syrup. 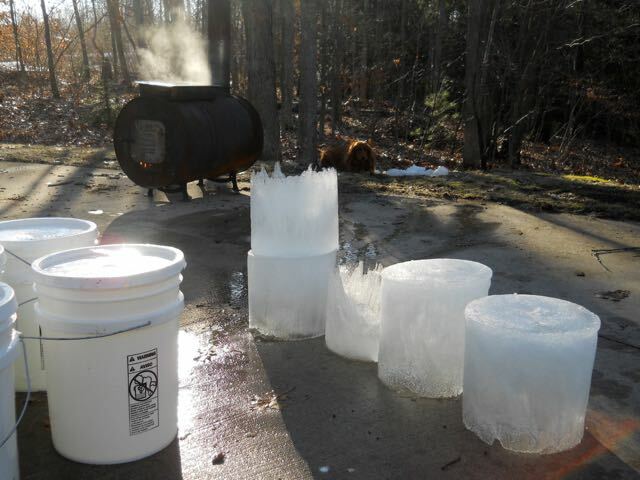 Last year we were right around the 40:1 ratio of sap to syrup, but it was about 60:1 this year which is a little disappointing given how long it takes to boil down. We tapped a few additional trees this year, but we aren’t sure what type of maple they are. It’s possible that they aren’t sugar, red, or black maples which have the highest sugar concentration in the sap. We’ll find out when the leaves appear. We had a cold snap a week or two ago, after we had collected a bunch of sap. All of our collection buckets were full, stored in snow banks, and ended up partially frozen. The internet consensus seems to be to chuck the frozen sap since it is believed to have a much lower sugar content. Because it would considerably shorten our boil time, we decided to try it, but it didn’t seem to hold true in our case as we didn’t have as much syrup as expected from that day of boiling. At least we didn’t have to worry about the stored sap spoiling that week! This entry was posted in maple syrup. Bookmark the permalink. Looks awesome! You guys are so industrial. I love that all of the sap was boiled using the wood from the forest, too. They are truly giving trees! You’re right about the trees being “giving.” Might be the topic of a post some day…but it reminds me that I meant to mention that this endeavor burned up a whole cord of wood (though most of it was junky wood that we intended to use for this rather than burn in the house).